Around here, in Southwestern Virginia, we like Barbara Kingsolver. She and her family are a recent, permanent addition to the SWVA area. She grew up in the Kentucky Appalachians and, until a couple of years ago, spent her winters in Arizona. Back in 2006 Kingsolver came to Floyd and spoke at the high school. She read from her latest book Animal, Vegetable, Miracle and signed copies of her book of essays, Small Wonder. Always interested in supporting local economies, Kingsolver asked that the purchasing and selling of copies of Small Wonder be handled by a local bookstore rather than by a corporate chain. My mother was ecstatic. As the owner of noteBooks, the town’s only bookstore at the time, and a fan of the author, it was an exciting event for her. My mother got signed copies of the book for all of her daughters and it was in this way that I was introduced to Barbara Kingsolver. I read Small Wonder (published in 2002), and I enjoyed most of it. As is probably the case with most collections, whether they be of essays, poetry or short stories, there are going to be some that grab you and others that just aren’t your cup of tea. In this collection, Kingsolver writes about her wordly travels from the eyes of a nature-and-people-lover. She reminisces about her childhood and touts the benefits of supporting local farmers and living off the land. She writes, with heartbroken sincerity, about humanity’s response to the terrorist attacks of September 11th. She also discusses environmental dangers threatening parts of the world, both near and far. But the two essays that I enjoyed most were the letters; she wrote one to her daughter and another to her mother. The entries are beautiful, raw and I sincerely believe any female who is, has been or ever will be a daughter or mother should read them, especially if, like me, laughter through tears is one of your favorite emotions. The next Barbara Kingsolver book I picked up, about a year later, was the novel The Poisonwood Bible(1998). One of my sisters had long proclaimed it her favorite book. There must be others who feel the same way, as it remains her best-selling book and was a New York Times Bestseller. The Poisonwood Bible is the story of a missionary family who travels to the Belgian Congo in 1960 and the ways in which the experience changes each of them. The book is written from the various points of view of each of the four daughters and their mother and spans over three decades. This book made me keenly aware of Kingsolver’s extraordinary relationship with language. The narrators thought and spoke in very different ways and the methods in which words were manipulated sculpted poignant characterizations of each one. The next book I read was one of her first novels, The Bean Trees (1988). It was obvious this book lacked the worldly sophistication of the previous two, but I think I enjoyed it more. It was very real…very human, simple but vividly organic. It must have been somewhat autobiographical since it told of a young woman from Kentucky who found herself living in Arizona and the observations of the differences between the two regions permeated the story. It’s also easy to see Kingsolver’s developing passions of nature and personal relationships which continue in her later works. A sequel to The Bean Trees was written a few years later. Pigs in Heaven is on my short list of books to read soon. When I told my mom that my next review was going to be a feature on Barbara Kingsolver she said, “Well, you HAVE to read her latest one.” I actually didn’t even realize there WAS a latest one (luckily for me I have a mother who is so with the times). As it turns out Animal, Vegetable, Miracle (2007) is my favorite Barbara Kingsolver yet. In this nonfiction book she expands on some of the issues she touched on in Small Wonder, namely the wastefulness of corporate agriculture and food shipping, how the United States has somehow gotten twisted up in our way of thinking about food and our relationship with what we eat, perhaps because Americans lacks a distinct food culture of our own. The book documents the year in which her family vows to eat only foods that they either grow or raise on their own or which can be purchased locally. I found the whole book to be very conversational (funny!) and not at all sanctimonious. It is especially relevant in our area because we are fortunate to have local farmers to buy from and good soil in which to grow food ourselves. The book also serves as a basic how-to on getting started on your own garden and recipes to use throughout the year. Barbara Kingsolver has written twelve books, all of which are available or can be ordered at noteBooks. Incidentally…Mom still has 42 copies of Small Wonder left over from the author’s visit to Floyd and she’ll happily sell you a copy at 40% off! What an amazing book. What an amazing man! Greg Mortenson is a real honest-to-goodness hero who proves that with enough bravery, hard work and determination, a person really can change the world. In 1993 Mortenson, a mountain climber, was in northern Pakistan to attempt to climb K2. His attempt failed, and in his exhaustion and disappointment he accidentally wandered into a remote Karakoram village, Korphe, where he was greeted with warmth and hospitality. Mortenson was so moved by the people’s kindness, and by their poverty, that he promised to return and help them build a school. Three Cups of Tea is the story of how Mortenson worked diligently to fulfill that promise and the extraordinary events that transpired as a result. 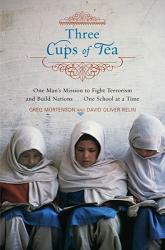 Amidst an increasingly volatile political environment, (leading up to, including and after the terrorist attacks of September 11, 2001) Mortenson continued to insist that the greatest weapon we have against terrorism was education, especially for the girls of Pakistan. Not only is this book a tribute to the power of peaceful solutions, but it’s a great recent history lesson as well, explaning the events leading up to the current situations in Pakistan and Afghanistan involving the Taliban. It’s also an insightful glimpse into the Islamic cultures of the middle east and the USA’s influences there, both good and bad. I think this book should be required reading for high school seniors, at least for as long as US troops are involved in conflicts in the area. I’d also confidently recommend it to anyone, as it was recommended to me. It was a surprising inspiration.